2.5" Free Flowing Pipe Helps Exhaust Gas Exit Quicker! It fits directly to the exit of the original catalytic converter on Skoda Fabia 1.9TDi vRS (130BHP) models, built in the period March 2003 - April 2007. NOTE : THE IMAGE SHOWS THE ACTUAL SKODA FABIA vRS 1.9TDi RACE SYSTEM. This system deletes the rear silencer & catalytic-converter altogether so expect a deeper more hollow exhaust note. It fits directly to the exit of the turbo on Skoda Fabia vRS 1.9TDi (130BHP) models, built in the period March 2003 - April 2007. This tailpipe deletes the rear silencer altogether so expect a deeper more hollow exhaust note. It fits directly to the exit of the original centre silencer on HATCH versions of the Astra Mk5 1.9 CDTi (100bhp,120bhp & 150BHP) models, built in the period April 2004 - January 2010. It bolts directly between the exit of the Catalytic Converter and the inlet of the rear silencer on all Zafira VXR 2.0-16v Turbo (Petrol) models built in the period June 2005 onwards. 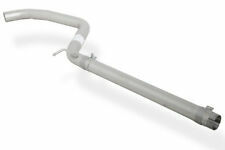 NOTE: THE IMAGE SHOWS THE ACTUAL ZAFIRA 'B' VXR'HOFFMANN' RACE-TUBE. It fits directly to the exit of the catalytic converter on 3 and 5 door HATCH versions of the Astra Mk5 1.9 CDTi models, built in the period April 2004 to 2009. NOTE: THE IMAGE SHOWS THE ACTUAL ASTRA MK5 1.9 CDTi (NON DPF) 'DOUBLE DELETE' SYSTEM. VAGSport Resonator Delete Pipe Kit. 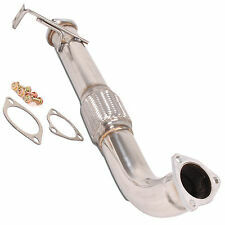 - VAGsport high flow resonator delete pipe. Skoda Octavia Mk3 VRS 2012 . 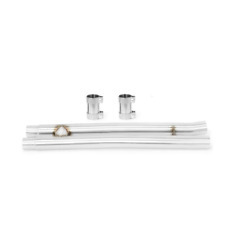 This kit replaces the standard centre resonator in the exhaust system which usually reduces exhaust notes by filtering the flow, causing a turbulent air flow. NOTE: THE IMAGE SHOWS THE ACTUAL ASTRA MK5 1.7 CDTi VAN & ESTATE 'SILENCER DELETE' SYSTEM. This well engineered 'Double Delete' performance exhaust system fits as a.
VW GOLF R MK7 HATCH RES DELETE Stainless grade 304 with anti-drone pipe fitted. Unlike normal res delete’s these have very minimal drone. This is all due to the anti drone pipe which cuts out the harmonic resonance. The only drone you get is over 80mph in 6th gear. Will be making these per an order so expect up to 2 weeks delivery time. All pipes come professionally welded and tested prior to fitting. Any questions feel free to ask! SWAP RESTRICTIVE CAT FOR A 2.25" PIPE ADDS INSTANT BHP! 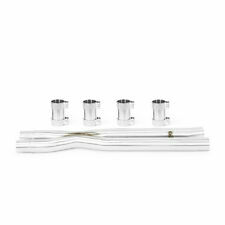 Built in flexi joint to reduce strain on your exhaust. UK Seller! UK Call Centre! Express Delivery Available! Swap Restrictive Cat For 2.75" Pipe Adds Instant BHP! Prowler Sport Renault Clio 200 Renault Sport 2.0 Mid Section Exhaust Pipe. Renault Clio 2.0 200 BHP Renault Sport. Huge saving on typical price. Very high quality build, with a beautiful finish, made in Italy. Does not include sensors. 100% Inox/ stainless steel. Suitable for and does not fit any model other than. 2.5" Bore all the way through - 1350mm long! 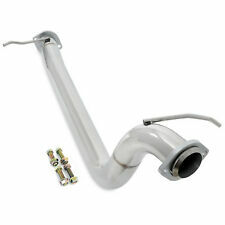 Prowler Sport Mitsubishi Lancer EVO 7 / 8 / 9 Down Pipe Exhaust Pipe. Mitsubishi Lancer EVO 7 / 8 / 9. Very high quality build, with a beautiful finish, made in Italy. Huge saving on typical price. Does not include sensors. 100% Inox/ stainless steel. Suitable for and does not fit any model other than. Milltek Sport Performance De Cat Secondary Catalyst Bypass. Fits Both OE And Milltek Sport Cat Back Systems. Milltek Sport exhausts are made from high-quality type 304 aircraft grade stainless steel that is anti-magnetic and is less susceptible to discolouration. Car Exhaust Muffler Silencer Tornado Trim Steel Metal Diameter 51mm/2"